bartlett mitchell has launched ‘Perkee’, a new premium, sustainable coffee brand. Perkee is produced in partnership with Bewleys and the Soppexcca coffee co-operative in Nicaragua. The co-op (which is 40% female run), was set up by Fatima Ismael and aims to improve the lives of its members and the community. Soppexcca’s profits are ploughed back into education, diversification and health centres in Nicaragua. 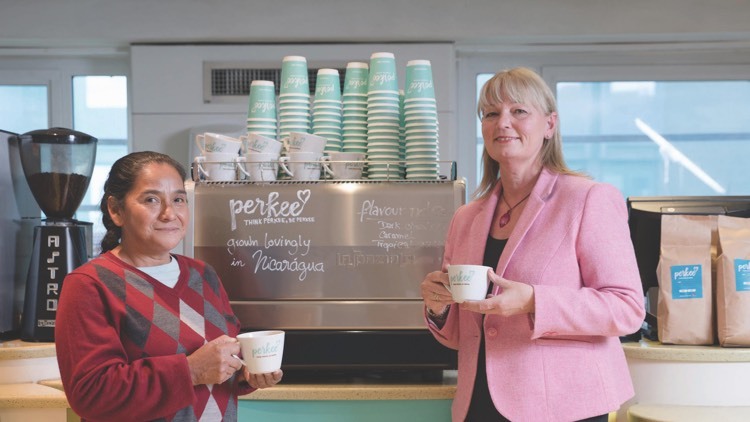 “Customers increasingly expect a brand of coffee in the workplace with exceptionally strong ethics and Perkee has been developed to meet these expectations and more. We have carefully designed every element of the Perkee brand including training, merchandising and uniform. Perkee delivers a lively, uplifting and positive experience for our customers and consumers and we have seen really encouraging commercial results from our initial rollout”. With dark chocolate and caramel notes, Perkee coffee is single origin 100% Arabica bean from Nicaragua, which is roasted in Yorkshire. Chef Director, Pete Redman has created a complimentary sweet and savoury all-day range to be served alongside Perkee in order to maximise revenues for our clients. bartlett mitchell has recently appointed Miguel Camara to the newly created role Coffee Brands Manager. Miguel, a former Barista Champion Award winner is leading the implementation of Perkee and heads up barista training at bartlett mitchell’s dedicated Barista Academy. Perkee was launched to coincide with Fairtrade Fortnight. bartlett mitchell hosted Ana Maria Gonzalez Narvaez, a farmer from the Soppexcca Union of Co-ops in Nicaragua with their coffee partner, Bewleys and Fairtrade Bristol at a new Perkee Café.